Winter's candied treasure hidden below the snow, just waiting to be picked and savored. Enjoy the scent of sweet berries under winter frost. This fragrance combines notes of simmering cranberries, red currant, and sweet blackberry. 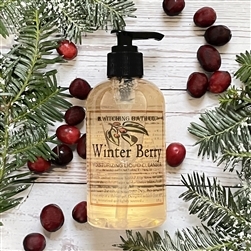 Formulated for use as a luxurious shower gel or one-step cleansing hand soap, our foaming liquid soap formula is a real treat infused with festive red jojoba spheres! It leaves your skin gently perfumed with our alluring natural fragrances. 8 fl. oz.